Tonight we started out at the Ruth Bancroft Garden, for the press opening of their sculpture show. The object was to get local media outlets to come see the show before it opens so they could write laudatory articles and drive great attendance. I guess a blog is part of the media, and I had to be there to serve up the the dozens of devilled eggs I made, so it was a double header for them. After we were finished, Gail and I took BJ out with us to the Walnut Creek Yacht Club, an old standby we haven’t visited in some time. 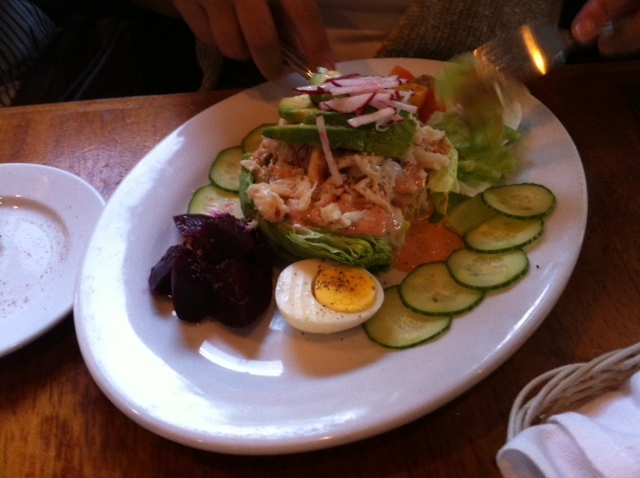 BJ was in the mood for a crab louis, and it just seemed like the right place to go–turns out it was a wonderful choice. I made an opentable.com reservation from my phone, and our table was ready when we got there a mere 15 minutes later. The Yacht Club looks like it should have the ocean right outside–the wooden tables, the decor, the design, are all perfectly appropriate to the theme. Service was quick and friendly. The first pleasant surprise was on the wine list–BJ had a South African bubbly, Gail tried an Argentine concoction comprised of a mix of 3 wines, served over ice with a slice of lime–exceptionally light and refreshing on a hot day. 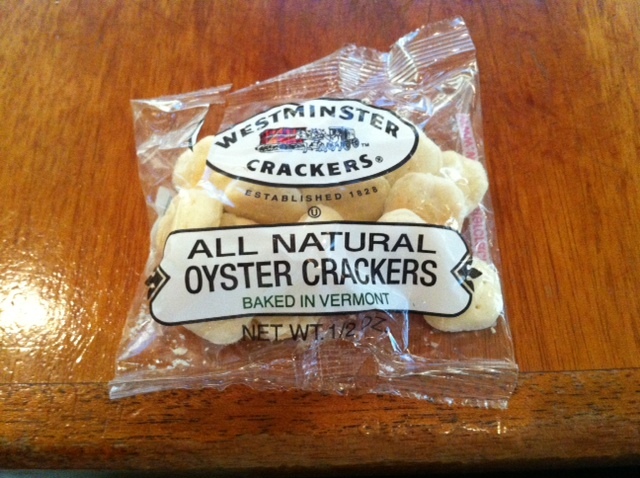 Why do they call them oyster crackers if there are no oysters in them? I ordered the soup; they brought me the crackers. Notice that they are baked in Vermont–a state not noted for its oyster beds, given that it has no seashore. I wonder about things like this. In any event, the soup was unlike anything I have had before. 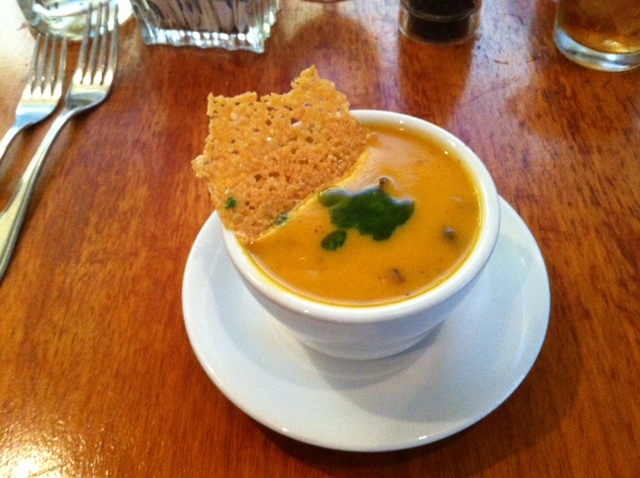 Sweet Potato soup with Italian sausage, dressed with a cheddar cheese tuille. Sometimes the first bite of something is great and then it pales–this was the reverse. It took me a while to get into it, but then the depth and complexity grew on me and liked it more and more. Soup, tuille, a shot of something green to make it look better. 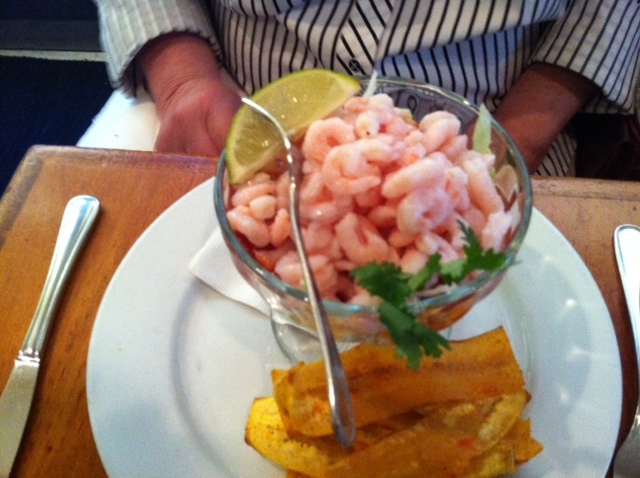 The menu has the usual things you’d expect in a fish house–lots of different fish, offered in lots of different ways. What moved me tonight, though, were a couple of the appetizers, so that’s what I ordered. 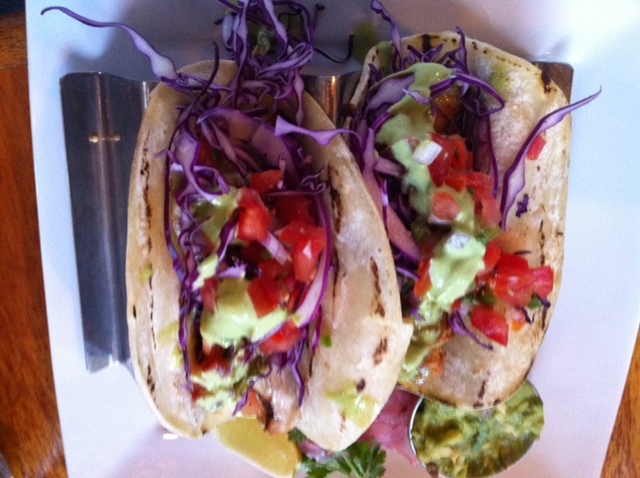 First up, the fish tacos. You get two of them, with the fish either grilled or battered. So I had one of each. They arrive in a rack so they don’t fall apart, accompanied by guacamole. They call this an appetizer--it could pretty easily be called dinner. The two tacos would easily make dinner for most people. They were hot and fresh and tasty and rich. Gail, who ordered them as well, added hot sauce to hers, but I’m a purist (besides being a hot-sauce sissy), so I just enjoyed them plain. The other appetizer I couldn’t resist was the Ahi Sliders–three tiny buns topped with a napa cabbage slaw and a slice of seared Ahi, along with a bit of shredded carrot/jicama salad. I liked it, but then I like seared ahi pretty much any way I can get it. I thought the buns were essentially superfluous, and didn’t eat the tops at all. 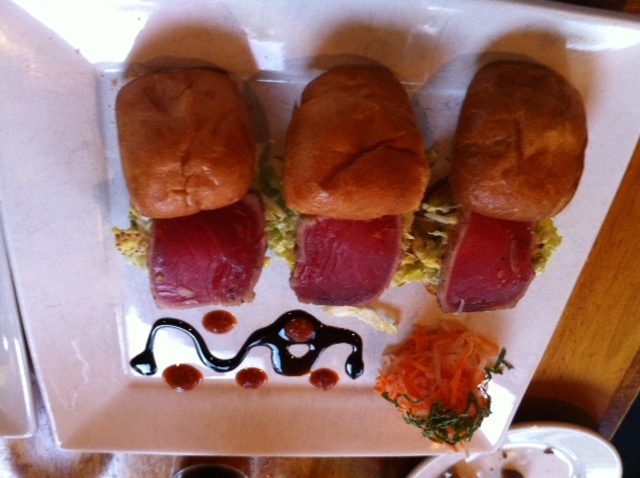 Ahi tuna sliders--as beautiful a presentation as you are likely to find. The bottom line? We liked it. We’d go back for the fish tacos. We’re glad Walnut Creek has restaurants like the Yacht Club. If you’re in the mood for fish, it’s the place to go.